What could be more perfect than sitting in the garden having a great time entertaining family and friends on a warm summers day, with a few drinks, sizzling barbecue...laughter...relaxation......it's chill out time! These are moments to savour in our busy lives. We look back on them as very happy events; longing for the next fine day, when we can let time pass us by and forget the outside world. Just fantastic! There are many benefits, not least reducing stress, putting things into perspective, time for enjoyment, or just getting out in the fresh air in a comfortable and relaxing environment. It's such a good way to unwind. 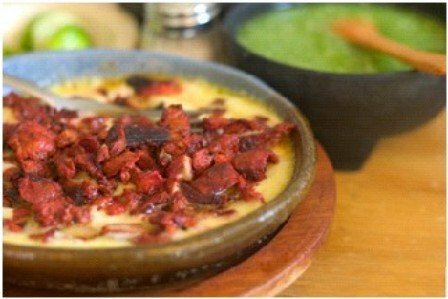 And it doesn't have to be a full on event: it can just be a few impromptu nibbles and a glass of wine, or a few beers, with friends, after a long, hard day. I love these times to catch up and have a laugh. Creating an outdoor living space, or even an outdoor garden room makes these times so much easier to achieve effortlessly. It's fairly easy to do this, and doesn't need to be hugely expensive. With a little imagination, you can have your outdoor living area up and running very quickly! Let's have a look at some ideas, and get that party started! The good news is not a lot, really: that's the beauty of it! Let's start off with the simplest first. A patio or decked area, with some colourful pot plants is probably all you need to make your area attractive and welcoming. The important thing is to section off the area in some way, so that it has the cosy and intimate feel ideal for entertaining. This could be done with just pots, planters or trellis. 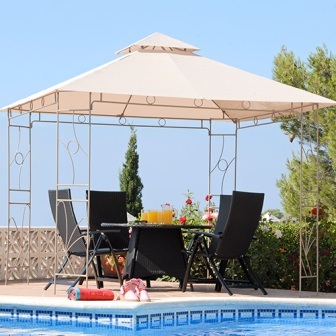 Think carefully about where to position your seating area for shade or sun to fit your specific needs. Here is a combination made from the free raised bed plans, filled with rockery plants, and a couple of posts supporting the trellis panel. This can be used to simply section off your patio area. The plants make all the difference, adding a splash of colour and that ever-important height. Adding some height can be a real bonus, because it gives a feeling of enclosure, and can provide a framework on which climbing plants can grow. 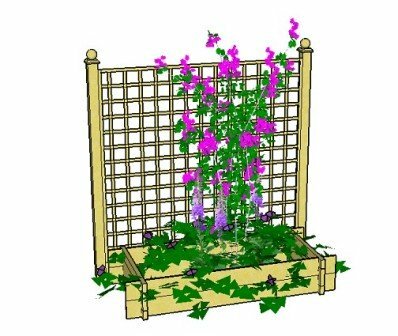 This can be done with trellis and planters, as above, or with a pergola: either as a diy pergola or in pergola kit form. 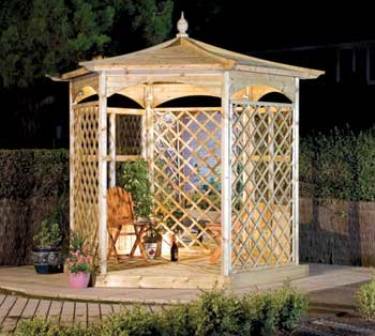 Gazebo are also ideal for outdoor entertaining too. 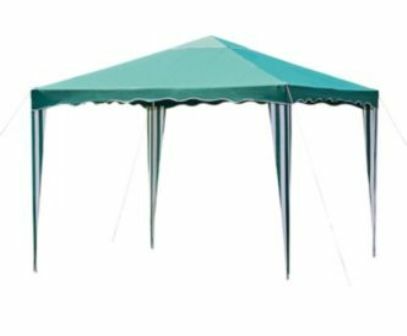 Gazebos are wonderful for entertaining as they tend to have a solid roof, making them ideal for protection against the sun, shelter from the elements and creating a cosy and intimate feel. 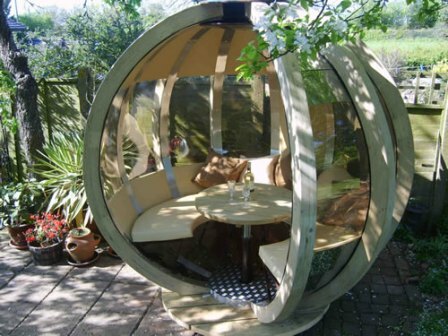 They can be used to great effect in the garden for entertaining and relaxing. 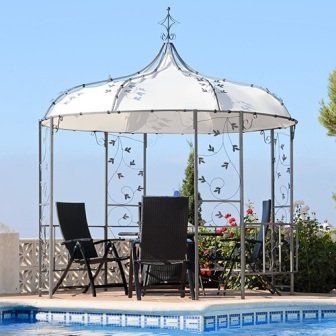 These metal gazebos have become very popular recently and look absolutely gorgeous with a few carefully placed, attractive plants, either in pots or growing through the supports. Because they are very self-contained, the feeling of intimacy and cosiness is achievable very quickly. Relatively, they are an extremely affordable option. There are so many products available today to make your outdoor living space attractive, welcoming and interesting but, before thinking about these, it is a good idea to make decisions about how all the hard and soft landscaping will fit together. With a huge range to choose from, in all different styles, shapes, materials and prices, these are great for creating a fantastic area for entertaining, transforming your garden in a very short time. 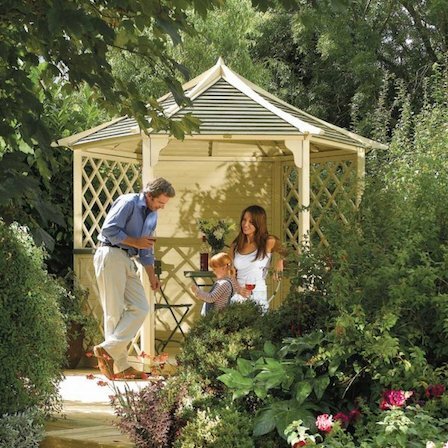 A corner pergola made from the additional diy pergola plans, and a pergola and deck kit combination provide a wonderful place to relax. 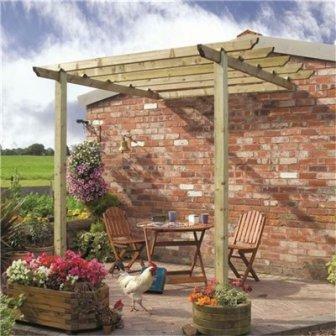 These pergolas can be used with attractive trellis panels to make cosy corners and private areas. 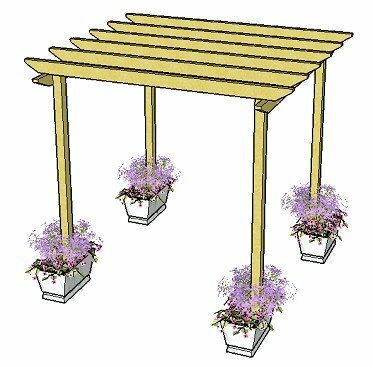 Plants can be used either to climb over the pergola or planted in pots placed on or around the structure. Simple, yet superb! Paving can be used instead of decking as a base for your seating area. Find some excellent ideas here: there are lots of pictures in the gallery! The main advantage of this company is that they are much cheaper than others who supply the same products, and they have great customer service. If you would like to include a pergola, this can be placed on the paving using bolt down post anchors, or fixed in the ground, around the paving, using post anchors or concrete. A very affordable option is to create a seating area using decorative gravel. It is relatively cheap, and comes in many different different colours and sizes. However, it isn't as easy on chair and table legs, being a non-rigid surface. 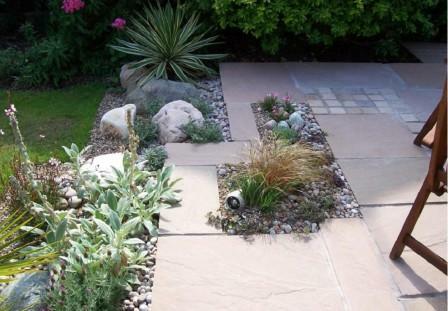 A mixture of decorative gravel and paving works well and is easier on the pocket! Whether you choose to build your outdoor entertaining area very simply, or in a more elaborate style, I hope these ideas have inspired you to see what can be achieved. Make your garden into an outdoor space that everyone can enjoy!